For many years it was a deeply guarded secret in the supplement industry when it came to where most branch chain amino acids were derived from. Were you even aware? Chemically treated duck feathers and pig fur. Yes, that’s 100% the truth. Duck feathers and pig fur contain a BCAA rich component called keratin. Ancient herbalists were using keratin based treatments for wounds as far back as the 17th century due to their amino acid composition. However, as food processing techniques became more efficient in modern times, and what we mean by more efficient is that they figured out how to monetize keratin waste products like feathers and fur, BCAA’s became more widely available for medical foods and subsequently sports nutrition. 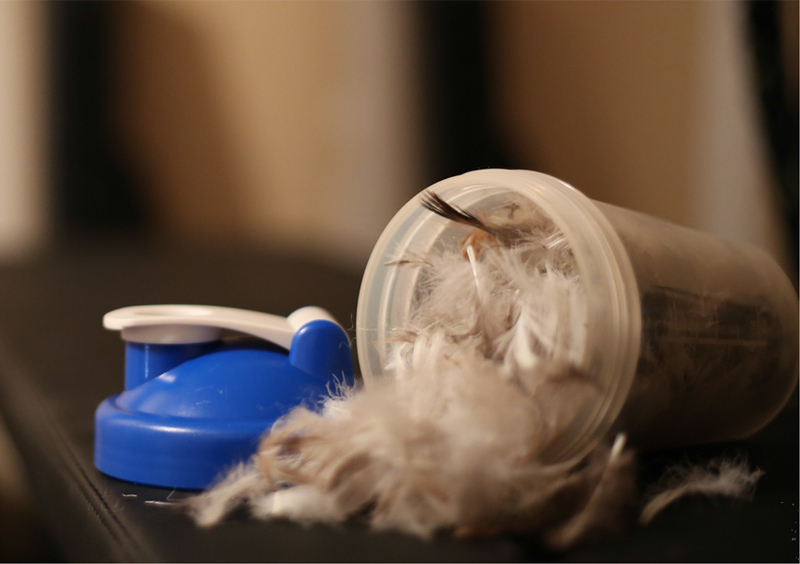 When you treat feathers, fur, and hair with certain acids and cleanse them with various chemicals, BCAA extraction become possible. Once upon a time, BCAA’s were actually considered expensive so the use of animal based BCAA’s were more attractive than their plant based alternative to most sports nutrition companies. On the other end of the BCAA sourcing spectrum you have plant based sources derived from either soy or corn. Corn has become a more popular starting material in the fermentation process of BCAA’s because it is not considered an allergen like soy. The Japanese began exploring many of these processing techniques in the early 1900’s. As these techniques improved and the body of research supporting the use of BCAA’s in disease based nutritional intervention grew, so did the demand for BCAA’s. Much of these were used for medical foods as well as parental nutrition IV protocols in the latter half of the 20th century. So where are we with all of this today and how is this relevant to you? Most sports nutrition products are still using animal based BCAA’s. Why? I honestly don’t know why other than it’s been considered status quo except for a very small minority of companies who were willing to spend 3-4x more on plant based fermented amino acids all along. However, times have changed and more companies will be joining the plant based BCAA movement soon enough. So how will the companies that aren’t adopting plant based BCAA’s going to fend off harsh criticisms for not changing their ways when you are start asking them the tough questions? With that in mind, here are some clear cut answers to help you educate yourself with. Myths Companies Will Tell You about Animal vs. Plant Based BCAA’s. Wrong. Plant based BCAA’s are slightly more bitter, especially since they are instantized with sunflower oil. To get them to taste on par with products utilizing animal based BCAA’s and soybean oil instantizing processes, a more expensive flavoring and sweetening system must be used in products containing them to be pleasing for the customer. Wrong. Newer analysis techniques were developed to limit adulteration and the claims some animal based amino acids were from plant sources. The process is called nitrogen isotope composition analysis and it is very real. Wrong. They are about the same price these days and have been this way for well over two years now. In the past, this may have been true but not now. Flavoring and testing techniques will be pricier, but creating quality products generally comes with a greater cost anyway. At the end of the day, both types of BCAA’s will help boost recovery and limit delayed onset muscular soreness. The research has not inferred otherwise. However, when it comes to having a sustainable source of BCAA’s and the need to shift away from animal sources, plant based fermented sources of amino acids are the clear winner. Don’t let anyone tell you otherwise and most certainly don’t shy away from asking what your favorite BCAA product is made from. Kim, Dong-Hee, Seok-Hwan Kim, Woo-Seok Jeong, and Ha-Yan Lee. “Effect of BCAA Intake during Endurance Exercises on Fatigue Substances, Muscle Damage Substances, and Energy Metabolism Substances.” The Journal of Exercise Nutrition and Biochemistry J. Exerc. Nutr, Biochem. 17, no. 4 (2013): 169-80. Huang, Jingyu, Philip N. Nkrumah, Gloria Appiah-Sefah, and Shijiang Tang. “Authentication of Pure L-Leucine Products Manufactured in China by Discriminating between Plant and Animal Sources Using Nitrogen Stable Isotope Technique.” Journal of Food Science 78, no. 3 (2013): H490-4. This entry was posted in Industry News and tagged amino acids, animal, bcaa, extraction, feather, hair, plant by NutraBio Labs. Bookmark the permalink. But isn’t 90% of corn grown in the U.S. Gmo? How good can that be to use in these products? I don’t get it… what’s wrong with animal based BCAAs? If it’s a ‘vegetarian” thing, may I point out that it’s not a demand for chicken feathers that drives the poultry industry, it’s a demand for meat. So using the feathers seems like a responsible thing to do rather than this by-product of a chicken harvest go to waste. Until you figure out how to make a chicken breast from corn, there will be more feathers than we can find uses for. However, we have plenty of uses for corn already, and corn is a water-hungry crop. It is hardly environmental neutral. No if you could claim that BCAAs from plants somehow were better utilized by the human body, that would be a different story, but that is not the claim that you are making, so again I say… I don’t get it… what’s your point? I totally agree that it’s a better use of animal waste products to convert the feathers into bcaa. Why is the general opinion these days that it is bad. If there is evidence that fermented plant based animos are better for you then I can understand the arguments for change. I’ve also heard fermented plant based aninos referred to as ‘natural’ and the aminal derived type as not but how much more natural are feather and hair, they certainly aren’t chemical. In the end I think it’s all a marketing stunt to make people buy more fermented plant based animos. I look for the plant based verbiage prior to buying any product. Could Nutra-Bio indicate on their advertisements and packaging if the product is plant derived and or vegan please? PLANT BASED ???? SOY?? CORN?? GENETICALLY MODIFIED … MOST OF THE US CROPS ARE GMO …. WHY WOULD I WANT / ACCEPT THIS ? IN SHORT, I DO NOT!!!! and PERHAPS NOT FROM EITHER SIDE. I seek out organic, non GMO pasture fed / finished meats, eggs, raw milk and milk products organic vegetabls etc … and avoid 99% of the supermarket stuff by reading the ingredient list … yes even on the certified organic products … I do not want organic soy nor organic canola oil etc etc .. I and my wife are well into our 60’s (I am well over 65) .. I have only been to a doctor 3 times in the last 48 years … I am very healthy, I still work (more than most (younger) people I know) I am not overweight, low blood pressure and BPM, low cholesterol, no diabeteas no arthritis, no aches and pains, no allergies, no asthma, no migraines, I DO NOT take prescription medications, I still have most of my hair all be it a bit grey … In short … YOU ARE WHAT YOU EAT ! I raised my kids on this same regimen (although who knows what they ate outside the home) and they are thriving healthy adults with families of their own. I am not rich … barely average income (without averaging in all the Gov. jobs that raise the US average) but I would rather pay more for “GOOD” food and vitamins than pay less for food and then pay a lot with my health. Do not count on any Gov. agency to protect you, your food, your health … you need to get smart and do it yourself … and by doing so there will be more of the good stuff .. just by voting with your dollars instead of the likes of Monsanto’s dollars and others. ( it seems to me I recently saw a > $25,000,000 in re-election campaign fund contributions from such …..
spend the EXTRA money to offer their PATRON(s) Fermented Soy Protein. It is a KNOWN FACT Isoflavin Soy Products cause Gynecasmastia in Men. Isoflavin is a KNOWN PhytoEstragen that WREKS Havoc on the Male Endocrine System. Companies such as Warrior by Health Force and Delgado Protocol are Light Years ahead of you in this Respect. I’d be remiss if I didn’t mention Sun Warrior as a Superior Protein Manufacturer in this regard. Hopefully. NutraBio will Catch up to the aforementioned amazing Protein Manufacturers. While I do agree with the theory of your article there is one thing that bothers me about plant based bcaa’s. If most is made from corn then isn’t it a possibility that you are just introducing GMO’s into your body. I read an article the other day that stated most all corn today is GMO corn unless it is packaged as organic. I think I would rather stick to duck feathers. This is true, but with the animal-based ones, you are ingesting something which was produced with a number of chemicals. That’s likely just as bad as the GMOs. I can’t speak to chemicals vs GMOs, but the meat that was used for the animal-based BCAAs were probably fed with GMO corn and soy. So either way, you may be ingesting GMOs. Agriculture and the food industry is really difficult to navigate. This article argues that plant-based BCAAs are as effective as animal-based BCAAs. That is all well and good, but is there any advantage to plant-based BCAAs? The article states the cost of extraction has been equalized, but that there is a greater cost to flavor plant-based BCAAs. If that’s true, what possible reason is there to produce plant-based BCAAs? Is there a performance or medical advantage I’ve missed? You went through a long dissertation regarding the difference between the plant source and the animal source of BCAA’s but you did not say which method your company used. – Do you have a product referral for the vegan, non-GMO BCAAs? I want to ask something, is this animal BCAAs natural or Chemical fermentation? I’m a meet lover, so I care more if its natural fermentation. What’s wrong with animal based BCAA’s? Do they have side-effects? Are they bad for health? Studies only showed that some BCAA’s are made from animal waste.But they failed to showed that whether animal based BCAA’s are bad for health or good for health. I’ve been consuming lots of BCAA’s. But till today,I haven’t noticed any bad results. If animal based BCAA’s doesn’t harm your health, then what’s there to be afraid of consuming them? I want to ask something, is this animal BCAAs natural or Chemical fermentation? Our BCAA’s are naturally fermented from vegetarian sources. We do NOT use the normal hydrolysis method which converts human hair, duck feathers or pig carcass. I’ve used both sources in quite large amounts. I can say without a doubt, with no other changes in my workout and nutrition routines that animal based bcaas are superior (in my opinion) in terms of effective recovery. At least for myself, overtraining set in very quickly while using the plant based bcaa sources. I experimented time and time again. I wish corn based bcaa where as effective for myself as they are becoming more ubiquitous and in fact cheaper than animal sources. Soon I’m sure the norm will be corn based ineffectiveness and animal based will be the sought after product for those who are savvy. I have no clinical data to back up my bcaa claims, but I can say that all opinions aside, clinical data shows the bioavailability of animal proteins to be far superior to those of plant origin. You can be a vegan hater all you want but in simple bodybuilding terms “meat makes meat”. I would assume this applies to bcaa proteins as well.